Blueberries are one of the few naturally blue foods on earth. Blueberries are one of the few fruits native to North America. The Blueberry symbolizes natural health: Blueberries contain antioxidants. Antioxidants help protect the body fight off the aging process. Some of the natural antioxidants in 1 cup of blueberries include 14 mg of Vitamin C and 0.8 mg Vitamin E. Data from the USDA Human Nutrition Research Center on Aging in Boston, MA) shows blueberries are among the fruits with the highest antioxidant activity. 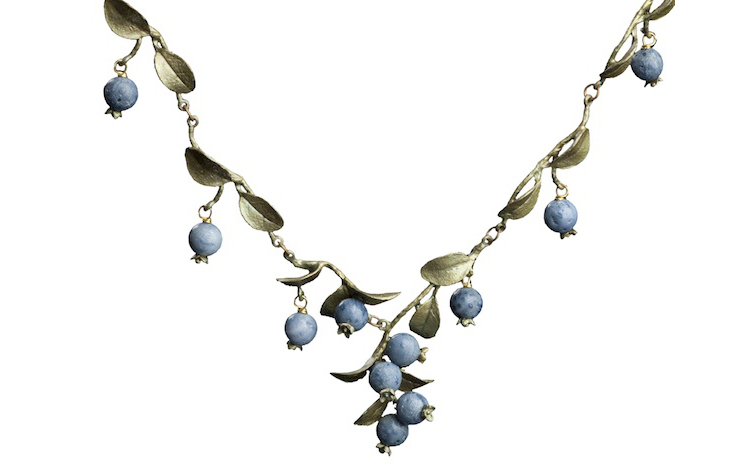 In this jewelry collection, blueberries made of deep blue aventurine appear alone as studs or in clusters on finely detailed necklaces in this almost edible line of jewelry by Michael Michaud! Hand patinaed bronze leaves and twigs nestle the aventurine just like the leaves of a mountain wild blueberry bush. Handmade in the U.S.A.